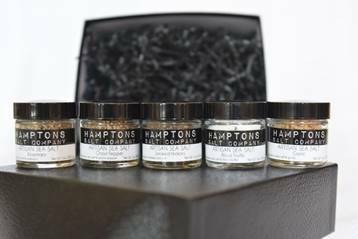 This holiday season, give the gift of flavorful goodness in the form of Hamptons Salt Company’s all-natural artisan salts. Smoked Applewood and Rosemary salts make the perfect addition to any turkey dish, while the distinct Black Truffle, Porcini and Garlic salts up the flavor on vegetable and fish as well as meat dishes. For the holiday sweets, try a sprinkle of the unique Espresso, Vanilla Bean or Maple Syrup salts. The Hamptons Salt Company collections feature an assortment of salts perfect for the foodie in your life. Each collection comes in its own sleek black gift box, and also makes the perfect host/hostess gift. Hamptons Salts have become a popular addition to the shelves in specialty food markets in the Hamptons & New York and now they are available in Massachusetts, Florida & California. These all-natural salts are a great alternative to processed salts, which is not only great tasting and comes in a variety of flavors, but also a healthier, unrefined option for you and your family. Each salt has a unique taste profile based on the sea from where it originated, making these raw, smoked and flavor infused salts a unique component to your dishes and a favorite among foodies and professional chefs. Sourced from around the world, popular Hamptons Salt Company has also been building a store presence on shelves across the country in 2016. The salts are sold at upscale locations such as Chelsea Market’s Bowery Kitchen, Hammertown’s 3 locations in the Hudson Valley (Rhinebeck, Pine Plains & now Great Barrington, MA) and at the Village Cheese Shoppe’s locations in Southampton & West Palm Beach, Florida). For those who are not located near a retail location, Hamptons Salts can be shipped nationwide from its website HamptonsSalt.com straight to your kitchen.